There are still many disagreements about how to improve the education system so that children graduate with the skills and dispositions they will need to succeed in life. Education reform discussions often center on how to tweak existing mechanisms, but what if the system itself is creating the problems educators and policymakers are trying to solve? 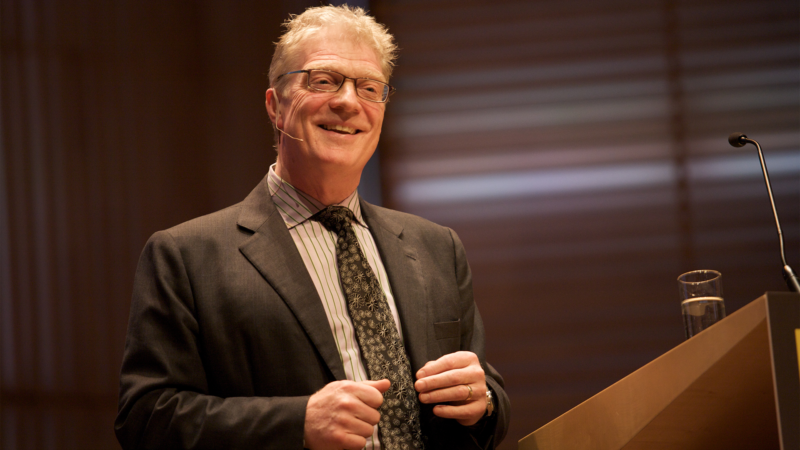 That’s the theory favored by author and TED-talk sensation Sir Ken Robinson. “If you design a system to do something, don’t be surprised if it does it,” Robinson said at the annual Big Picture Learning conference called Big Bang. He went on to describe the two pillars of the current system -- conformity and compliance -- which undermine the sincere efforts of educators and parents to equip children with the confidence to enter the world on their own terms. Education has become a strategic priority for countries competing for an edge in a globalized economy. Political leaders know future generations need to be ready to take on an ever-evolving economy and that a nation’s prosperity depends on a prepared workforce. These concerns have led to more comparisons across countries and attempts within various countries to standardize the education each child receives. The problem with this conformist approach, Robinson said, is that “human life is like the rest of life on earth; it is characterized by diversity.” Parents with more than one child know all too well that each can be radically different in temperament, personality and in their strengths and weaknesses. The same rules and parenting approach may work with one, but not the others. And yet this fundamental diversity in the human population is not honored within education. Instead, the curriculum has narrowed and now prioritizes a type of intelligence that favors academic work. "There’s much more to human intelligence than a certain sort of academic work,” Robinson said. And, “if you get preoccupied by a certain type of achievement then you don’t even look for other things people might be good at.” Robinson points out that when the system narrowly defines success, it will exclude a huge portion of students who don’t happen to be good at those few valued skills. “We marginalize other forms of intelligence; and it’s a big deal,” Robinson said. But if collectively those involved in the education system changed what it means to achieve in a way that honors the natural diversity of human life, many more people would see themselves as achievers and would push themselves beyond expectations set for them. The other central tenet of today’s education system is compliance, which Robinson sees best reflected in the testing industry, a multibillion dollar business. But tests only measure what test-makers put on them, and how can such a small group of people know what will truly be useful to a student in a quickly-changing future? Robinson is troubled by the trend of adults in the current moment trying to predict the specific-knowledge students will need. The current focus on science, technology, engineering and math (STEM) learning is a good example of adults looking at where jobs are right now and trying to make education fit. But who knows what other skills might be necessary 20 years from now? “The real principle on which human life is based is organic growth and development,” Robinson said. It’s based on the need to invent your own life.” But the education system is not set up to allow for that kind of organic development, although Robinson acknowledges that many educators are doing their best to protect this form of learning. “They’re doing wonderful work because they believe in kids and the work, but they’re doing it against a headwind,” he said. Part of the problem is the multitude of opinions and lack of clarity on exactly what it is an education should do. Debates about how to improve education will continue to rage because at a fundamental level participants don’t agree about why (or if) kids should go to school. 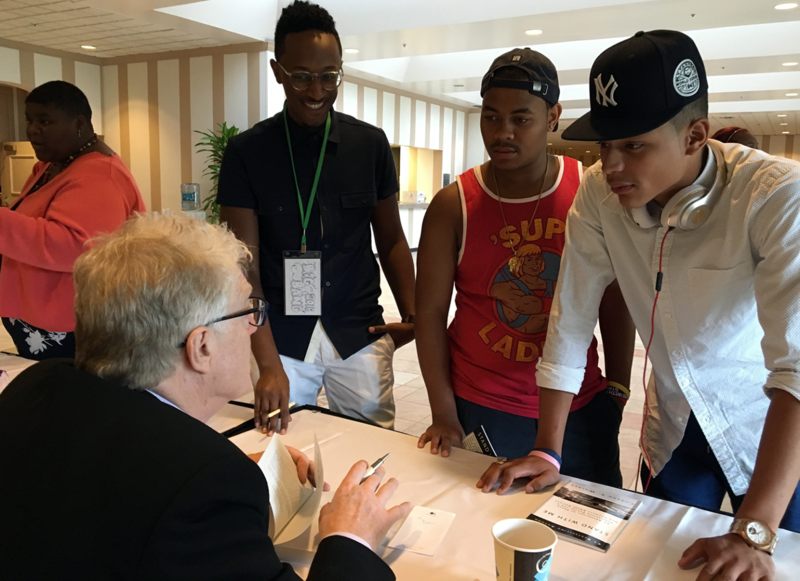 Robinson firmly believes that creativity is a central element of what sets humans apart from other forms of life on earth and so educators’ mission should be to bring out the unique creative energy within each child. Robinson believes education is “to enable students to understand the world around them, and the talents within them, so that they can become fulfilled individuals and active, compassionate citizens.” He doesn’t deny that learning information about the world is important, but he says it’s equally important for students to understand their own talents, motivations and passions if they are going to lead lives that satisfy them. The current system of conformity and compliance leaves no space for this type of self-exploration. “We spend more time talking about the outside world at school, but not enough time compelling the world within them,” Robinson said. But it’s the individual’s world view that ultimately determines whether that person stays in school, persists through challenges, feels motivated, interested, engaged and dedicated to work. And failing to focus on a sense of individual purpose could even be contributing to rising levels of depression seen in the US. Robinson doesn’t deny that education has an economic purpose, and that it’s important for young people to become economically independent and self-sufficient. But to do that, he argues, they shouldn’t all learn the same thing. Instead, they should be learning to be adaptable, to be innovative, to flow with change, to collaborate and other globalized skills that will apply to whatever area of work they are passionate about pursuing. An education can help expose students to different life paths and support them in finding their passions, while giving them the transferable skills to attack any problem. The education system is commonly compared to mechanization, a “factory-model,” designed to push cookie-cutter children through in age-based batches. Robinson finds industrialized farming to be a better metaphor because it deals with living organisms. Farmers went from an organic model of farming that prioritized crop diversity, rotation and fertile soil to a system of monocrops that easily fall prey to pests, which in turn are killed with chemicals. The focus is on output and yield, which increased with chemical fertilizers. This system does what it was designed to do -- it produces a lot of food, but at the expense of the environment. Similarly, the education system has focused on increasing the number of high school graduates, the output, with no concern for whether they become happy, fulfilled human beings. “The way you increase the quality of our children’s experience, their life chances, it's not by focusing on yield, but on focusing on the culture of the school,” Robinson said. A healthy mix of mentorship, arts, physical education, academic subjects and more creates the “healthy soil” in this analogy, the environment in which kids can flourish. Author Paul Tough also talked about strong learning environments as the key element to success in his book Helping Children Succeed. Robinson said when schools get the culture part right they become an important asset for the community around them. “Great schools enrich the entire neighborhood, the entire ecosystem,” Robinson said. But “schools that don’t get their role in the community can drain the life force out of the community.” The best schools develop the human resources of the community to further more investment, pride and high expectations. “We spend so much time containing and constraining our teachers and students who have so much talent,” Robinson said. And while some parts of the conformist and compliance-based system are unavoidable, other parts are perpetuated by well-meaning educators simply because that’s the way things have always been done. Robinson is calling on all educators to look at the available resources differently, more creatively, and to use them to create learning environments that allow individual students to thrive and flourish.